"Mint Condition - Ready to Move in..."
Attractive modified bilevel in Ranchlands. This great family home shows 10/10 & its like new condition is ready for you to move in. 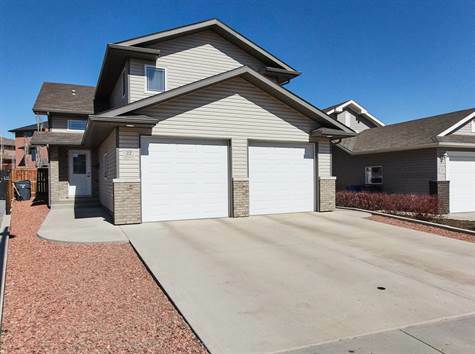 Large tiled entry with coat closet & direct access to a fully finished & heated garage. The main floor boasts a vaulted ceiling & is very open & bright. A spacious rich oak kitchen is complete with island eating bar, corner pantry, & full stainless appliance package. A great place to entertain guests or gather with family! A garden door leads off of the dining area to a nice covered deck with sunshade blind plus a lower level patio - great for a future hot tub. 2 bedrooms on the main & the master is just a few steps away on its own upper level with large walk-in closet & 3 piece ensuite. The basement is fully finished & includes large family room with gas fireplace on thermostat, an additional bedroom, 4 piece bath, laundry room, & plenty of storage. The spacious backyard is completely fenced/landscaped & has underground sprinklers & a storage shed while the front offers a low maintenance exterior. Great value for this immaculate turnkey property.